Buy Your HPE ProLiant MicroServers from PC LAN! Although cloud-based servers seem to be all the rage right now, a robust, and reliable on-site server is still your best bet for many small to medium-sized businesses. From a security standpoint, you will know that your information is secured, the device is extremely easy to use, and its sleek, robust, and compact design makes it truly a win-win for any startup company or home-based business. When you combine all of these great qualities with staff information sharing and collaboration efforts, the Hewlett Packard Enterprise ProLiant suite of MicroServers turns out to be your perfect pick. Hewlett Packard has been an industry legend for almost 80 years now and is still one of the few manufacturers touting a MicroServer series, which is less bulky than its traditional enterprise-class rack server counterparts. These MicroServers can be grouped into clusters very easily, and are preferable to smaller enterprises and lean entrepreneurs who need a lot of computing power but don't wish to have a big, bulky rack of servers. As you can see in the below pictures, the compact, yet robust, HPE ProLiant MicroServers are square-shaped and are extremely lightweight. Their convenient size and shape allow them to be placed almost anywhere in your home or office, and they are more affordable than the typical rack server. HPE ProLiant MicroServers provide simple access to your system hard drives, memory and PCIe graphics adapter slots, as everything has been designed for push and play. Custom installations and upgrades can now be done easily to your microserver due to this. 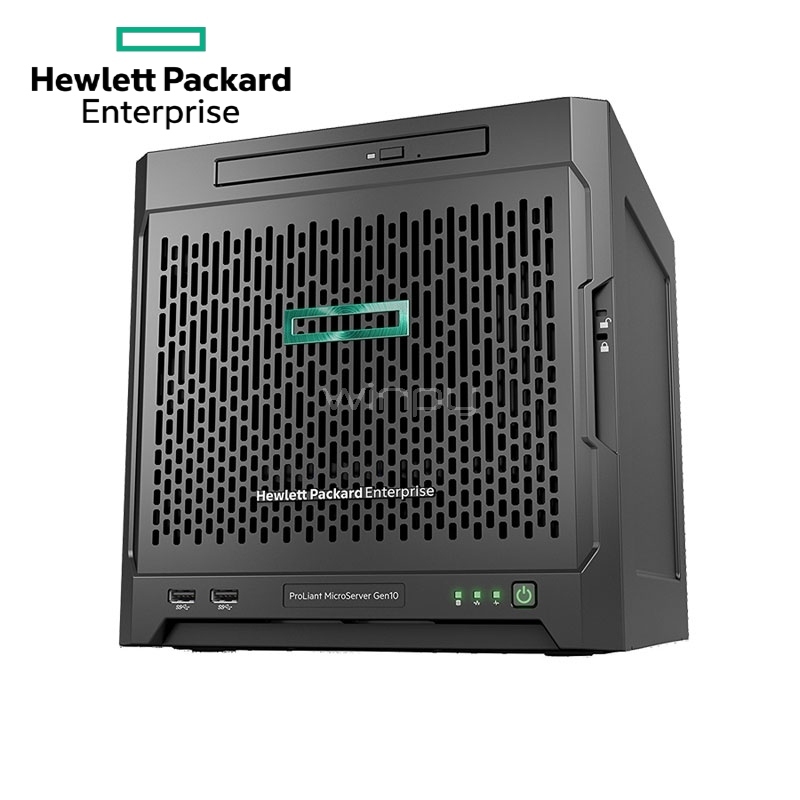 Our website offers Gen10 models of the HPE ProLiant MicroServer series. The HPE ProLiant MicroServer class of Gen10 models, for example, are considered to be more entry-level than their non-MicroServer counterparts, which consist of much larger, bulkier rack devices. The Gen8 models, also can tout their own expertise and have differing qualities for differing needs. Whichever series you choose, all of the Hewlett Packard Enterprise brand of MicroServers are guaranteed to be a safe, convenient and affordable options for the lean entrepreneur or small startup company. The following is only a small list of what they are capable of doing for you. There are now more added features than ever before to ensure that your HPE ProLiant MicroServer perfectly suits your every need. The HPE ProLiant MicroServer Gen10 X3421 8GB-U 4x1TB NHP SATA 200W PS Server/S-Buy model, in particular, utilizes the AMD® APU, (also known as the accelerated processing unit,) with graphics core embedded. This improves the overall graphics software performance of the HPE MicroServer, without requiring you to install an additional PCIe graphics adapter. The HPE MicroServer products on our website are embedded with extra graphics workloads, which enable it to have far better display capabilities than previous versions. Your network speed and work efficiency are also enhanced with the new HPE Dual Port which comes with 10 gigabytes of storage within the network adapter. Now your operating system will boot up quicker with the new HPE 240 GB SATA Small Form Factor Solid State Drive and, if you prefer, you can now build your own custom solution with the RAID 5 model by using the HPE Smart Array E208i-p SR Gen10 Controller. This new generation HPE ProLiant MicroServer technology now also supports the Red Hat Enterprise Linux Version 7.4. More Security Than Ever Before! Trust us, extra secure enhancements are never a bad thing! Perhaps the best feature of the HPE MicroServers for sale on this page is that they are made to specifically protect you and your business from security threats. These aren’t just any security threats. HPE ProLiant MicroServers are some of the most secure systems in the industry. They can be relied on to provide your office environment with the most effective data security, integrity, and business continuity. For example, the iLO 5 management chip found inside the HPE Proliant Microserver has a built-in digital fingerprint of the firmware of the server itself. This allows your company to recognize the firmware that is installed and running. If there happens to be a case of illegal firmware or malware in existence, you can simply choose not to run it. This way, you can easily detect if there is unapproved firmware in the system and have your security team try to find its origins. This critical server firmware has multiple layers of protection within the device, which is what every business owner needs. The manufacturers of the HPE Proliant MicroServer systems know that it is pertinent to secure the inside of the server so that it can also be protected from the outside. You wouldn’t want your competition to have a key to your house, would you? The same goes for your business items. You can rest assured that your internet security is a top priority with your HPE Proliant MicroServer, no matter which model you choose. All of our products stand by the Hewlett Packard mission, which is to provide their customers with products that provide affordability, simplicity, and security. These are the key things that small businesses care about, and you should too. HP’s variety of servers can accommodate any size business while also providing it with these multiple levels of security. From a one-person home start-up to a fortune 500 company you can now literally see your team and how they are working from virtually anywhere. We host the entire platform of HPE MicroServer products right here on our website for your convenience. You can buy any HPE ProLiant MicroServers here, where you will find only the best-discounted rates available on the internet! Trust us, you will thank us later!